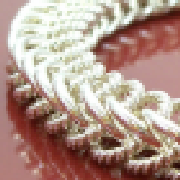 Welcome to Mostly Maille's Handcrafted Chainmaille and Viking Knit Jewelry and Accessories! Thanks for stopping by! If you stopped by Mostly Maille at an art/craft show and do not see the item you want here on Zibbet.com, PLEASE contact me! Not all of my inventory is listed here, and I will be happy to create a custom listing just for you.